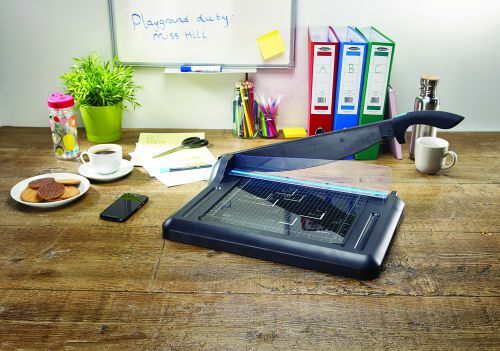 The Avery A4 Office Guillotine is ideal for lower volume, regular cutting use in schools and offices. A strong yet portable guillotine with a self-sharpening steel blade that glides through your cutting jobs with ease. As an extra safety feature, the blade cover moves with the cutting blade as it rises and falls so it is never exposed. This A4 guillotine easily cuts through up to 15 sheets of 80gsm paper at a time and with its clear baseboard markings for paper and photo templates and imperial and metric measurements makes cutting more precise. Our guillotine comes with a 5 year guarantee with replacement spares for this time too. It has the TUV GS and BS marks, which ensures it is manufactured to the highest quality and safety standards.